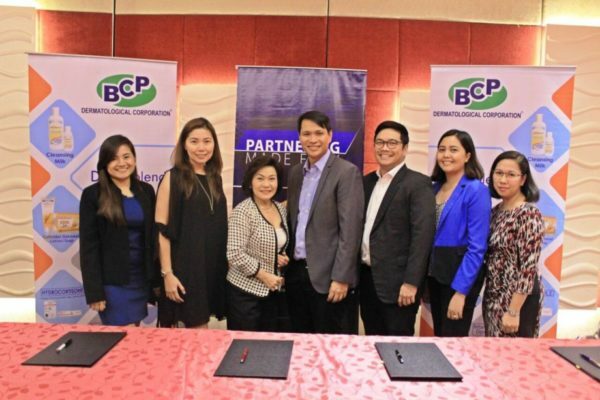 The contract signing was attended by Ms. Dina dela Paz Stalder, President and CEO and Ms. Lea Juan, Operations Manager of BCP together with MDI’s Chief Executive Mr. Jojit Aguilar and VP-Finance, Mr. Allan Tanlapco. BCP Dermatological Corporation is a dynamic company focused on dermatologicals, both pharmaceuticals and cosmetics, providing solutions to every type of skin condition. On the other hand, Metro Drug, Inc. is a leading pharmaceutical distributor in the Philippines. With its partnership, quality products will be distributed nationwide, thus patient’s compliance will be an advantage. • Cleansing Milk – a hypoallergenic facial and body cleanser for all types of skin. • Zinc Oxide 10% Cream with Aloe – has the power to get rid of diaper rash. • Hydrocortisone 1% Cream/Lotion – has the power to relieve steroid-responsive dermatoses and other allergic conditions. • Papaya Orange Soap – a breakthrough in whitening that guarantees not only white but moisturized skin. • Guava Tea Tree Soap – has a natural defense and remedy against body odor and helps prevent acne formation. Together, BCP Dermatological Corporation and Metro Drug Inc. are committed to the paramount goal of making a difference in people’s lives by providing the most effective healthcare products with a desire to exceed customer’s expectations while constantly striving for excellence.